Item: Front End Loader Bank Name: Birth Date: Font: Please Choose OneNoneInterlocking MonogramCircle MonogramScript Two LineOld EnglishRoman Three Line (Block) Who is this item for? 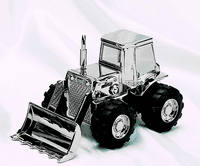 What "little man" wouldn't want a shiny new Front End Loader to put all his pennies in? This wonderful bank can be engraved in the bucket with the child's first name. Makes a great new baby, birthday or any other occasion gift. 3.25" X 3" X 5.5"